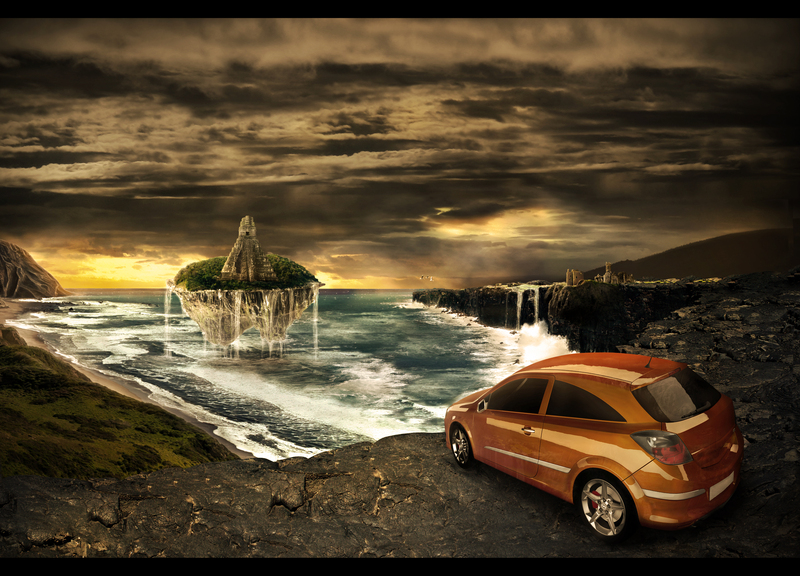 The initial concept was the creation of an 'atmosphere' - a background for the car. Using images and some painting techniques over that images I made a fantasy scene. This tutorial will explain some of those techniques and how various Photoshop tools work. Let's get started! Define what you will do, and how you will do. I recommend sketching, but some people are abler to only keep what they want to do in their mind, and work from that. Search some references: all kind of things related to your initial concept. That will help so much. These steps, are extremely important, principally the sketch. Try to define the sources of illumination in the sketch, you will need it. About the references, I searched specifically for car ads, and I found the website of 6B Estúdio. I found some awesome references that served as inspiration for this illustration. Now I start a quest for stocks that fit with the initial idea that I had. I started searching for the platform where the car will rest. I started searching on stock.xchng for some cliff edges, but didn't find anything that was flat enough or with a compatible perspective. Now we'll start to collage our images together. As the name suggests, it's about cutting and pasting each stock into our work. Each kind of image is a different type of render after cutting. Mainly, I use the Pen Tool, but I'll show some others too. I think that is the best cutting tool, because it uses paths, so the final result becomes more anti-aliased and more smooth. The Pen Tool can be used to render any non-organic material, I mean: we can render cars, motorcycles, clothes... But the Pen Tool doesn't work well for organic images like peoples, animals, landscapes, trees (these are really difficult to get good results with the pen tool). You can access the Pen Tool (P) in the Tools Menu. Also, enable the Path option, so when you trace with the Pen Tool, you will not create a Shape layer. The last resource that I like to turn on is the Rubber Band. To enable it, you click on the arrow after the Custom Shape Tool icon, then a box will be opened. When you're rendering with the Pen Tool, you need to trace a little inside the original stroke of the image. This avoids the leftover bits from the background of the image. After tracing, you just need to click with the right button and select the Make Selection option. Tip: if you pressing Shift after you closed your trace, you may then create more selections. The Eraser Tool (E) is very useful to render irregular surfaces or blurred images. Also there are a lot of specific brushes to render grass, hair, and some others. These brushes can be downloaded on the resources list at the beginning of the tutorial. They save work and your work will look more realistic and professional. The Eraser Tool combined with a Graphic Tablet can be very useful, because the pressure sensor of the tablet will make for more precise traces. Let review how this works. I used a background with a different color, this way I didn't leave leftovers on the image. I don't care about the cut quality because I can correct it later. Tip: you can expand your workspace by pressing the Tab key. This will hide anything and you'll only see the image workspace. To make them appear again you just need to press Tab again. Also, if the brush tip disappears, make sure Caps Lock isn't turned on. There are a lot of another methods to render images, like masks, plugins, selections by color and the Magic Wand Tool too! This tool, I bet you already tried to use, but maybe you are unhappy with the final result. This tool would be the perfect solution to rendering, but the final quality of the cut-out render is too bad. See the result of a render with the Magic Wand Tool below. Observe that it left white parts and it is really serrated. One solution for this is the Defringe Tool. It is found by going to Layer > Matting > Defringe. It will fix the white issues on the image a little. But I really recommend that you don't use these methods for objects that stay too close. I mean, you can use the Magic Wand Tool to render minor images that stay far away in the illustration, but not for large images and especially not those that are the focal point. For more information on Selection Methods visit the Psdtuts+ tutorial A Comprehensive Introduction to Photoshop Selection Techniques. After you found all stock images you will need to do a collage, cut-out every image using your preferred method and put them together. This step shows how important the initial sketch is, because you can lose yourself when you're doing the collage. Don't worry about realism for now. Just put them together, on some areas I need to use the Clone Tool (S) to fill it. See the screenshot below. Using the Clone Tool is quite easy. I don't cover the details of how to use it here, so I recommend you read this clone stamp tutorial. The collage steps don't need to be perfect, you really don't need perfect realism at this stage. Tip: keep every image on a separate layer. It's really recommended because sometimes you will need to edit one thing separate of the others and if you keep everything on the same layer you will had some problems. The process was quite simple, I just clone some parts of the original image in another layer, and use the Pen and the Eraser tools to cut and make the continuity of the image. See the original images (I deleted some parts to fill better with the cloned layer). Below is my semi-finalized image, I just put the images in their respective places and cut/cloned some areas. Each photograph was taken under different circumstances, places, lighting, and times. In other words, it's very hard (maybe impossible) to find different images with the same exact characteristics. That was one of the hardest things on this job, because the two images that I found of the ocean had so many differences. To give the same tone to both, I used some adjustment tools. I think it will be easier and will create a better effect if I edit the right image. I think it's very unnecessary to show a lot of values that don't necessarily apply to other images. So, I'll show some of the tools I used and I'll leave to you the task of making the images match as closely as possible. Access Levels via Command + L or Image > Adjustments > Levels. This tool controls shadows, midtones and highlights individually. Take a look at the diagram below. This diagram shows three tones: all images had darker or highlighted areas and some of of them are mid tones. In our case, the first image is too saturated, in other words: the image has few midtones and many shadows and highlights. The predominance of extreme tones causes an impact. But the second image is completely desaturated, all the image are in the same lightness and midtones. The shadows and desaturated image aren't too far as the highlights ones. If you don't have much experience with manipulations, then I think it will be hard to see these details, but as the time pass unconsciously you will start to see that better. So don't be hurried and calm down, they are abilities that come with time. See some functions of these tools below. We saw how edition the lightness of images works. We can control if the image will be more dark or clear, but how do we adjust the image's colors? There is a specific tool for it, it's Color Balance. This tool allow us to change the balance to darker, mids and brighter colors. Let review the functions of these tools. One of my favorite tools. The Gradient Map gives a gradient for certain tones. It's hard to explain how it work, I made a diagram to try to explain it. This tool can make some really nice effects if you play with the Blending Modes. I hope you understood how these very useful tools works. After I did the background collage, I started to find some stock images for the sky. Normally I try find some images on sxc.hu or on DeviantART, but this time the size of the final work was very large, so I looked for images in CGTextures. This site has high-resolution images. There are many great stocks on the site. Again, I just did some collage here, and didn't worry about the differences between the images. I just took care to create a visual logic between the images. I create clouds that seemed more distant and the others were made to appear closer. The tools I used were basically the Clone Tool and the Eraser Tool with brushes set to Hardness of 0. After I made the collage, all I needed was to apply the tips of the sixth step to standardize the lighting, shadows, contrast, etc. The final manipulation of the clouds is shown below. One of my references was this old job (please don't laugh, he he). I took the floating island idea from this work, but after I put the island on the manipulation, I had the impression that something was missing. So I had the idea of making the island emerge from the water. For this I painted water dripping with a tablet. The island was made separately from the rest, and for Psd Plus members you can review how this was made closely in the included PSD files. The final manipulation of the island is shown below. I used three images for the island. I used a stock of two mountains as the base and an image from another island for the top of the island. I made a preliminary collage, just rendering and pasting the images defining the composition of the island. The base of the island was made using only one of the mountains. It seemed very empty to me, so I used both mountains to mount the base of the floating island. The idea from the temple that was designed after I had placed the island in the original image and the island looked too empty for me. My idea would be to maintain the island as it has always been there, floating on the ocean. My preliminary island looks like the image below. Now we'll work on the lighting. I had in mind that it came from a point on the horizon of the image. So the back of the island will be the lighter side. If you look for some references, you will see that in images where illuminated source come from behind, the borders look more illuminated then the rest of image. On the image below, the red arrow represents the original illumination of the top of the island. The blue ones shows the original illumination of the base of the island. The orange part shows the desired illumination. Having finalized the island, I placed it in the manipulation, but thought it lacked something. I had the idea that the island could have simply emerged from the ocean, something more impressive. Water is one of the easiest elements to paint, at least in my opinion. I made a small guide to explain how I painted the water. They always help in the case of paintings: details and texture can be observed in reference images. You can find references in any site, a simple search for images on the web will bring you many images to review, but remember, you cannot use them in the picture, just observe them, respect other peoples works. To the water, I generally use a Hard Brush (with Hardness at 100%). You can decrease this value if you need. Keep the opacity low (around 20% in light areas and dark areas at 5%). Painting water is not difficult, however, is easy and even pleasurable, but we must maintain a logic when painting. In this case, as the island had already emerged from the ocean the water was dripping back to the sea. Note the track that water makes to fall into the sea. In places with greater volumes of water I formed waterfalls, where there is little volume of water. It flows only to fall. The arrows in red show the track made by the island. The water follows the opposite, attracted by gravity. Note when the water falls in the sea it forms waves and will be expanding, lose strength, and go away. See the painting without many details and the water is only a variation between shades of white with more or less opacity. In this diagram, you can see (again) the track of water. In relation to the volume of water there is a greater volume at the beginning of the waterfall and when it fall in some area, there is shock and water is thrown about. In regards to the lighting, instead of using shadows (I showed the image shadows, but for better viewing) in the areas of lighting, the opacity can be increased, contrary to the darker areas, where the opacity must be less . In the figure of the previous step you can see this with better clarity. After finish painting the water, I decided on some details. This is another element that is easy to paint, and follows almost the same logic of the water. I just fixed some details such as lighting, cracks and some patches in the images, my images (semi) final was that shown below. You must have noticed (or maybe not) that I didn't mentioned the stock of the car. It is because it is a special case. As I said, the initial idea was the creation an atmosphere for the car. That car used is a 3D render, in my opinion it's easier to work with 3D images in some cases. The first difficulty was the perspective of the car, which was in a very bad angle. This hindered my search for stocks, then instead of looking for something to adapt to the car, I had to make the car fit the background. Notice how the car's angle is completely different from the image. Using the Perspective Tool (Edit > Transform > Perspective) you can adjust the angle and perspective of the image. Another tool I used was the Warp Tool (Edit > Transform> Warp), but we must be more careful with Warp because it may distort the image too much. I leave a picture as reference for the perspective. I recommend that you use guide lines to help. Okay, placing the car at the right perspective was relatively easy. Now the problems...the first one is the shadow. Indeed, it is not a problem but a matter of finding good references. Analyzing the reference images is one of the first steps, after all, we don't record all the details in our minds. You can search for reference images by using Google, Flickr, deviantART and even sites of paid stocks, or the free ones. But you should never use the reference images. Respecting the work of others is the first step to being respected. But finally, search some images for the shadow of the car, you can use any source you find, I used Google Images. I see on the references that the shadow of the cars is almost straight, square or a rectangle a little unfocused. When the shadow is more straight, I like to work with Shapes. I do the initial form of the shadow using the Pen Tool, and I blur and delete what is necessary. Another good tip is to make multiple layers with different opacities alternating the Blending Mode of each layer. But finally, do not go on deleting everything. We need to keep the logic in place. The parts with higher incidence of light are those that have less shadows. The thought here is that the main point of light comes from the horizon. I made an example showing the main points of illumination of the finished image to use as reference for the shadow. In the diagram + is the intensity of illumination and - represents the intensity of shade. In the example above notice that there are two main points of illumination. The circle in red and the other in blue. The main light comes from the red circle, and reaches the car and the platform where the car is. The blue one reaches only part of the ocean and the coast on the right side. There are still some points with a third source of lighting - very low. This is the case of a space in the clouds, in the rear of the car and all other places are painted in pink. There is also a part where the shadows are prominent. You may notice how the car is a visible part and relatively light. The car is the main focus. This is a concept that always applies to every type of work, but in ads a special care must be taken because the emphasis should be on the product. Sometimes you exaggerated a composition, leaving the main product to the side, then the final result is not good. I do not like the color of the car. This was the first of a series of changes that I do on the car. To change the color of the car, I only duplicated the layer of the car and and use the Hue/Saturation adjustment. To select it go to Image > Adjustments Hue/Saturation (Command + U). As its name suggests, this tool changes the Hue/Saturation of the image. Additionally, you can change the lighting (Lightness). It is almost like a merge of the Color Balance Tool and the Levels Tool, but it is so much simpler. The Color Balance can also be used, but I particularly think it is easier to use the Hue/Saturation. Anyway, let's see how it works below. In this case, I just changed the values of Hue. The concept that I had is that the lighting would be predominantly orange, giving a volcanic feel in the image. But the red car was breaking this uniformity. So I decided to leave the car with a tone closer to the orange lighting. Now let's fix the lighting of the car. Based on the diagram of level of lighting, I'll provide a guide to create the lighting of the car. Note that the original lighting of the picture is completely different from the lighting required. To do this I used light brushes with Hardness set to 0, and four main colors: white (#FFFFFF), black (#000000) and two variations of orange (#E6BC72), and brown (#5B3B13). Using a low opacity, I did the most lightening of the car on the front. And the back was made darker. I put that layer in a Clipping Mask, so it will only occupy the limits of transparency of the image. That is, all effects will only reach the car. Note in the picture, the front looks pretty desaturated, but I'll fix that later. Now I did a series of adjustments in the car. The brake of the original image was in a gray almost without emphasis, therefore, decided to paint it in red. The process is very easy. With a brush in red (#ff0000), I began to paint the area of the brake in another layer. Then I put a layer on Soft Light after the regular opaque one, then delete the parts that remain. I decided to give a greater emphasis on the wheels, therefore I used the Burn Tool (O) in the area of the wheels on the Layer that was setting the color of the car. The Burn Tool is an interesting and useful tool, though I do not use it much. It edits specifically one of three tones in a simple and easy way through brushes. Like most of the tools in Photoshop, you can select which tone will be modified (shadows, midtones and light tones). The Burn Tool darkens each desired tone in the layer you're working with. Now I decided to correct the lighting of the car (so the car seems more saturated than before). A tip on the Burn Tool and Dodge Tool is to change in tone extremes (Shadows/Highlights) generates a more impressive effect. The Midtones soften the impact between the extremes of tone, remove the image results in alleviating much more impressive. But beware, you can't exaggerate, also you cannot do this with very realistic work, for example. Using the Burn Tool, alternating between editing the Highlights and Shadows came to the result shown below. Some surfaces reflect the environment around them. I advise you to look for references, because when this reflection happens there is often a distortion as well. The references helps in the creation of any reflective object: water, metal, glass, mirrors, while taking into account how each object reflects. It is impossible for a wood floor, for example to reflect the same as a mirror. The image shows the pieces of the copied file (each piece is on separate Layers). The next step is to define what Blending Mode to put the Layers. I had better results with the Blending Modes of Lighten and Screen with an opacity at 70% or less. There is no a basic rule for Blending Modes which is better, but I recommend you experiment until you find a good combination. I am particularly a fan of chromed details. I decided to chrome some areas of the car, only the details. To do this, use the Pen Tool to create shapes in the places you want the chrome. I chose the color #D9D9D9 to draw the shapes with. Having made this shape with the Pen Tool, I duplicated the layer and change the Blending Mode. I put the first one in Saturation and the another on Overlay. Now you ask, why? Simple, one layer will clear the saturation of the original image, and keep the same lighting, but will leave that area completely without color. The other layer simply adds luster to the chrome. With a few minor adjustments, we have finalized our car. Relax, this huge tutorial is coming to the end. After making the whole composition, I look at all the locations of the images to add detail. I really think that everything is in the details. If you take a picture of a house, it's not just a house, many years of events, might be a reform, or anything that has left marks in that house, and those are the details that make the difference in photo manipulations. After searching some places of the image, I found this part shown below. I decided to paint over the image to add improvements. When painting, I often use small brushes with the Hardness set between 60% and 100%, with low opacity, and use just using black and white. It is difficult to explain the process of how to painting. In fact, I don't know for sure how I do it. The only thing I take into account is the position of the main lighting. I tried to make it a more detailed and interesting mountain by playing with the brushes, and came to the result shown. This step is more a reference to details that you can add to its manipulation then a guide in itself. But at a certain point, references and good sources of inspiration are almost as important as tutorials and guides. As part of the island, I made a few cracks and the effect of wet areas on the island. To make the cracks is relatively easy. I used a dark color with high opacity and other high-clear with low opacity. After making the cracks using the dark, you must clear one of the edges, using as reference the lighting of the main image. For the wet, I painted the water with a low opacity brush with white color, and just highlighted the borders. Finally, after cutting and pasting the images, adjusting levels, colors, creating effects, shadows, and all of the previous steps, we arrive at the step that will impact the work the most. This part is the most important of all because it changes the overall look of the work. To see the difference, review the before and after images below. Let's go ahead and go through the steps that move us from the left image over to the right result. Our initial focus is on the car, I think you are tired of knowing that, but I do not think we talk about our secondary focus, which is the Island. After all, it is what makes the image so fanciful and incredible. To create the focus generally dim less important parts and try to lighten the most important. Usually the layer of focus is more or less like this. You may have noticed, both the areas of the island and the car are in evidence (white), the other areas are darker. This layer was in Soft Light with a low opacity. It may not seem like much, but the subtle effects are what make the difference. The lighting is nothing more than to create something that fits with the initial concept. Always try to keep in mind the points of light. As explained in Step 17, this diagram was in my head, I knew where they came from each source of illumination. Creating lighting is not difficult, it just requires a little attention. I usually work with Color Dodge and Linear Dodge to create the lighting, but also use other Blending Modes. A Long time ago, just when I started using Photoshop, I read a tutorial that basically explains lighting of signatures for forums. I do not know if you had contact with this type of work, but by that line that I stated. And this tutorial was a very valuable tip that I never stopped using it. I just paint a layer background with black, and put it to Color Dodge, or Linear Dodge, and use a light color, which gives a very nice effect as shown below. You can see that the places where it is painted in orange are places of strong lighting. The effect generated by the Color Dodge is below. The final effects basically transform the image. At this stage I adjust lighting, color, brightness and other things, not individually as before, but now the whole image will be edited. I recommend you play with all the tools in Photoshop adjustments, changing the Blending Mode, creating and experimenting with new ways and effects. The following is a guide and not a rule. Play with the colors of the gradients, using filters. Experiment and see the result you will understand what is behind this effect. There are theories that point, everything can be done, without exaggeration. I got these result with some Blank and White Gradient Maps set to Multiply. The final image is below. I really hope you liked and learn from this tutorial. I focused myself to explain the tools, not just putting values and more values, so can understand the methods used in this tutorial. You can see a final version with a larger resolution here. Hello, I'm from Joinville, Brazil. I'm a young digital artist doing mainly photo manipulations. I started playing with Photoshop around three years ago. You can see my work on DeviantART or on my online portfolio.